Well, I will admit they are tasty. So delish in fact, hubby has a hard time finding them at the bakery. When he does, he brings home as many as he can. Me, being the Health-Conscious Mother Of Today (HCMOT) [Hah! ], threw them in the freezer after a few days so they'd stay fresh. But that didn't sit well with daughter, who insisted we keep them on the counter. I come out swinging, regaling daughter with stories of my childhood when decorative metal breadboxes were all the rage in every 1960's kitchen... beautiful on the outside, but they hid the terror of gross moldy loaves everyone forgot were in there. It's no wonder I'm now obsessive about keeping all breads safe from fungus in our freezer. Daughter counterpunches by insisting that the bagels are too hard to slice open when frozen. I jab with a suggestion she mic them to soften before cutting. She dodges, bobs and weaves at my solution, declaring that ruins them; making them tough. Ding! Ding! Ding! The match is over and the ringside judges declare a TKO. The bagels are sitting on the counter once again. As a consolation prize, this morning I noticed another bag with a single bagel still remaining in the freezer, so I brought it to work. Lunchtime came and I couldn't wait to get to that chewy whole wheat treat. So I took a big bite and realized that yes, it HAD in fact gone stale. Actually, it had passed Stale. AFTER I swallowed that first bite (of course), I see the evidence. The green and white spots of "fur" that had me gagging and reliving that breadbox nightmare from childhood. I would have smugly told daughter "I told you so!" ... if I didn't feel like throwing up. I have a 60's metal breadbox. I love the nostalgia, the cool rounded look, the sound of it opening and closing. I didn't know frozen bread could get moldy. Huh, thanks for being the proof on that. What kind of bagels are healthy??? growing up, bagels were quite a foreign thing to this WASP from the midwest! when my mom would buy the occasional bag of lender's bagels she would put them in the freezer also. but then it was a whole process to toast (this was pre-microwave ovens), re-toast, scrape off burnt edges, then eat. so off i go to u-michigan where my new jewish friends taught me all about bagels. who knew it was ok to just tie the bag shut and keep it in the pantry?! 30 seconds in the microwave and life is good! moral of the story: if you eat the bagels fast enough, they don't need to be frozen to be kept fresh. Jeff: You're welcome. My contributions to society are numerous and varied. And selfless. And stupid. John: Exactly. But how many bagels can you eat in a day or two? Then they are definitely NOT healthy. Sometimes it's best not to say I told you so..Even if you are barfing at the time..LOL ! Look at the bright side...you can scrape off the mold and sell it as organic penicillin. You always make me laugh with your writing, Maureen! I remember the days of the breadbox and the pairs of heals, end-pieces, or whatever you called them silently sitting inside growing green and furry. 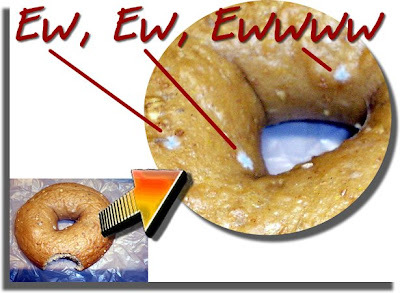 Bagels don't last long enough in our house to grow stale, let alone moldy, unless they are the cheap, pre-bagged ones. I think they are bagged stale! The fresh-baked are so much better, but then again, so much pricier too. That's exactly why I moved around the corner from the bagel shop. Ok, so it's not the ONLY reason, but they're yucky out of the freezer & they don't last on the counter 'cause they're not chock full of preservatives. So what else can you do besides move next to the bagel shop? Oh & btw - sorry you got a bite of blecky yucky mold!!!!! I bet your daughter put a moldy bagel from the kitchen counter into the freezer, because there is no way mold can grow on a bagel in a freezer. Either she did it or there is another culprit in the house. Rigorous questioning is called for. I love bagels but I can't get over freezing them either. It is just one of those things I have to have fresh. I usually only buy a few at a time so they don't go to waste. As for the mold, urgh, that would send me barfing too. Peggy Sez: This is true. So true… Not that she’d even listen to “I Told You So” anyway! Phoenix5: I know. The bakery bagels are much better. Yes, more expensive, but it is worth it. I just wish we could find them every day so we don’t have to “stock up”. Jill: You hit the nail on the head! I will definitely need to find a bagel shop nearby that stocks some good varieties. On a DAILY basis. Oh, and yeah, I can’t believe I didn’t hurl right then and there. I kept it down and fought the urge to Google “mold poisoning”… (just kidding). Sweet Irene: Although that’s a good theory, nope, I am sure daughter had nothing to do with it… she didn’t even know it was there. It’s my thought that it was moldy BEFORE I put it in the freezer… and stupid me didn’t even notice. Melinda: I don’t mind freezing them. Once they are mic’d, they are quite good and chewy (the way I like them… Oh, and I prefer them without the fur coat). Any blog about bagels makes me happy! Sorry you got a moldy one, though. Moldy is always gross. I had no idea bagels could still mold in the freezer. I thought the whole point of putting them in there was to keep them from going bad. But I have to agree with your daughter, they never quite taste the same after being frozen. I am sorry you ate a moldy piece of bagel and am gaging in response to the idea. ECHHKK! I'm a bagel fanatic. Ours don't get a chance to get moldy around here. I stick all our bread in the freezer. But I too was shocked that they got moldy there too! I'm always on mould alert... married to a microbiologist. Bagels are sooooo yummy, but they pack a punch in the calorie department. I love those *EVERYTHING* bagels though. I remember those metal boxes... or the roll top bins. Your bouts with your daughter sound a lot like the ones I have with my kids. Do we ever get to win? hilarious - yet EW at the same time. Sorry, I'm with your daughter on this one. I've tried to do the 'keep the bread in the freezer' thing, but it just takes all the good, fresh taste out of it. I keep the unused bread in the freezer and it stays pretty fresh...the current one is always on the counter, but with bagels, we try and eat them fresh within a day or two. That's the beauty of bulk type bagels :) PS. Don't feel too bad, I've also eaten mold on numerous occasions. Toners: Yeah, I’ll bet they are collectibles nowadays. Bradley’s Mom: Hope you had a great weekend too… always nice to hear from you! Karen Meg: Hah! Married to a Microbiologist… I need one of those! Obviously. Damon: Heh! That’s for sure. Huckdoll: Well, I guess I’ll live then… I’m sure many people have eaten mold and not even known it!